The 19th century American frontier is the vast stage on which this savage thriller is played. Mute wife Liz (Fanning) lives on a farm with her husband (Houston), their daughter and his son from a previous marriage, and is midwife to the local townsfolk. Matters take a darker turn when a new preacher (Pearce) arrives in town, his sermons brimming with religious foreboding. Over the next two and a half hours Liz and the preacher will engage in a battle of wits, reasons for which Koolhoven teases out novel-like via an ambitious flashback structure and ominously titled chaptered sections such as “Exodus” and “Retribution”. 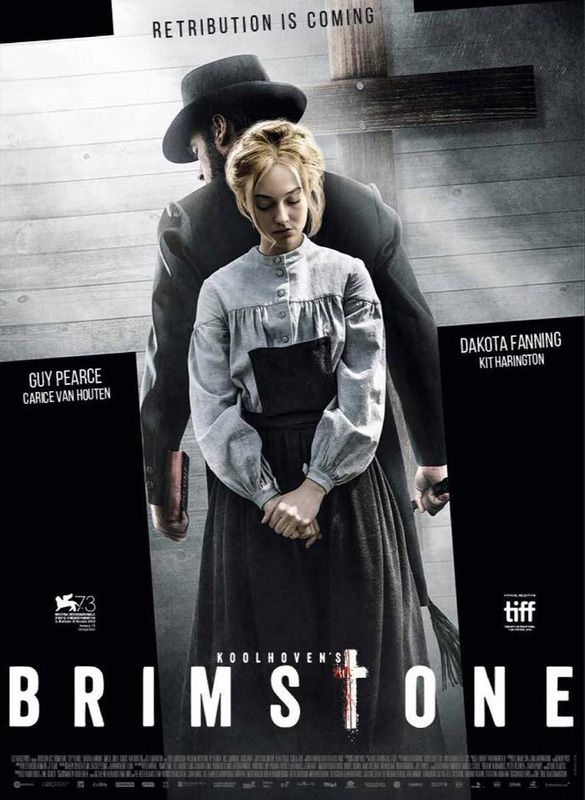 Brimstone feels like an epic Gothic novel, packed with incident, violence, passion and a remarkable central female character. Koolhoven also pulls in filmic references including old Hollywood melodrama and Westerns, plus The Assassination of Jesse James by the Coward Robert Ford, Cape Fear and particularly The Night of the Hunter. This latter movie is directly quoted via a sublime shot of Fanning’s Liz sitting on the snowy porch of her cabin, cradling a rifle. Small wonder Koolhoven opted against US studio money that would have denied him final cut in favour of pan-European financing that took years to secure (the director’s last film was 2008’s Winter in Wartime). Different European countries convincingly double for frontier America, brought to the screen with astonishing beauty by cinematographer Rogier Stoffers. Koolhoven has been criticised for perceived excesses in the film, and those who balk at Lars von Trier’s martyred women movies may wish to give this a swerve. But, as strong as the content is, the director never revels in violence or tips his film into prurience. Fired up by dynamic material, the actors uniformly bring their A-game. Dakota Fanning (replacing last-minute drop-out Mia Wasikowska) delivers a career best as Liz, a woman determinedly protecting her family from the world’s evils while never slipping into action hero cliché. Pearce is also on form as the mysterious, demonic preacher. Wiry, fixed-jawed and with an off-kilter Dutch twang and Amish-style beard, he could have been peeled off a 19th century photographic print and set loose on the world. A cast of recognisable actors populate the background, including Game of Thrones alumni Kit Harrington and Carice van Outen, plus Paul Anderson and Jack Roth, presumably recruited for funding purposes but still delivering great performances. Special mention also to Emilia Jones for a fiery performance as the younger Liz. Stopping this short of five star classic status is a final confrontation that strays into standard serial killer climax territory. A more imaginative end to the journey would have been welcome, but despite that misgiving Brimstone is a bold, daring, full-blooded experience.